So you’re doing a Whole30 program. And maybe you’re a few weeks in and are growing tired of making multiple meals for your family. Like, an approved meal for you… another for everyone else. Or maybe, you’re just looking for family-friendly and kid approved Whole30 recipes; because it sure would be a lot easier to cook one meal for everyone. If this is you, I feel you. I’m a mom to 3 kids that like different things. Eating clean and healthy isn’t the easiest thing to do at my house if I try to please everyone in my family. But what I can do, is cook Whole30 meals that satisfy most of the people in my family where everyone has a few elements they’ll eat. You’re probably trying to do this too because you’ve landed here searching for ways to make eating Whole30 easier when you have a family to cook for, right? Meal planning when you’re doing a Whole30 isn’t much different than meal planning for real food. 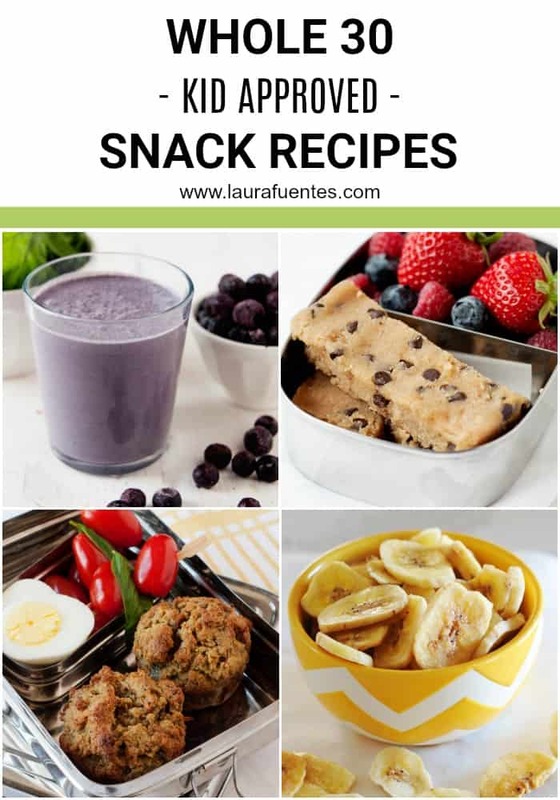 It is true that a quick drive-through is not part of your meal plan, so picking some family-friendly recipes should help you get started. I like to select 3-4 dinner recipes I know will jive well and add variety. Meaning, since I don’t want to eat chicken for dinner 3 times a week, [[I try to pick one chicken, one seafood, one with eggs, one vegetarian, and so on. After that, I combine ingredients with my meals so my shopping list is as short and tight as possible as well as minimizing ingredient waste. If you want to see a sample of what my Whole30 meal plan and ingredients look like for my family, get it here. It seems that the more one searches for easy Whole 30 recipes, the more they look like cooking traditional foods -right? There’s no denying that there will be a little bit more cooking involved when you’re cooking Whole30 approved meals or Family KickStart Meals. The real question is, how can you make cooking these real-food recipes easier on you when you’re short on time? The answer: meal plan for the week and break down the recipes to do a few batches of meal prep. Seriously, you’re going to have to prep the food if you want to have healthy options on hand when mealtimes come around. The meal-prep sheets from the Family KickStart Program are life savers and it’s one feature our members love about this family-friendly, Whole30 meal plan. Of course, you can grab a sample of the meal-prep sheet here. 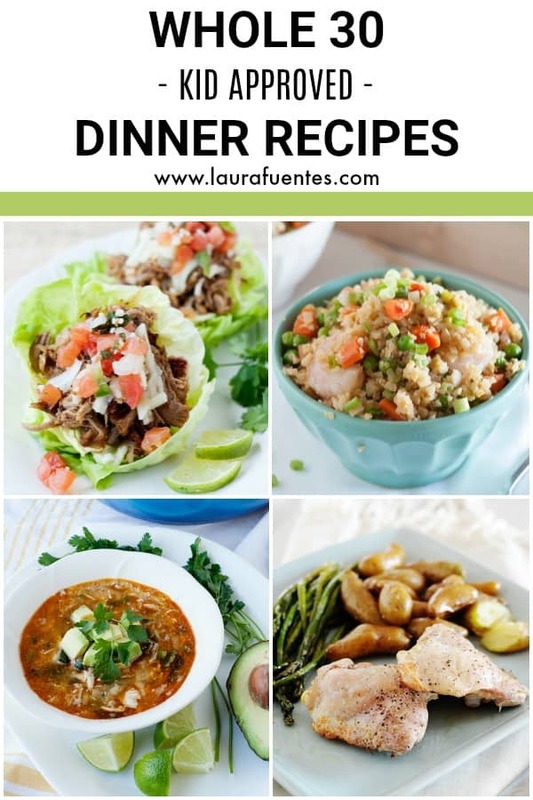 Below are a few recipes for each meal you can select from to help you get started. You’ve probably already noticed that “whole grains” are out when it comes to Whole30 and Family KickStart breakfasts. By the second week, many of the parents in our community wonder, “what else can we eat that’s not eggs?” I totally get you. 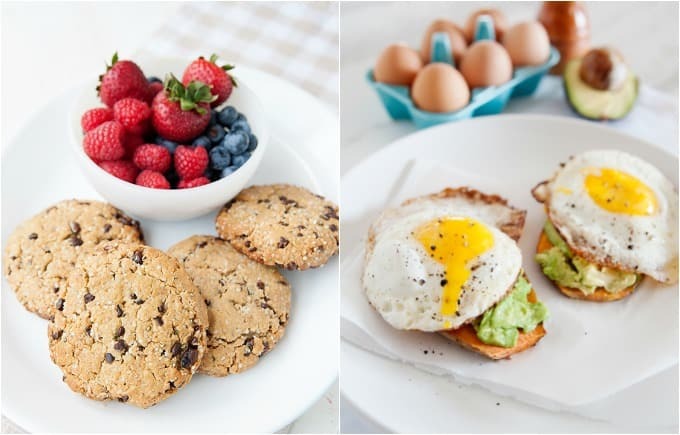 For starters, if you’re on the go a lot you can eat one of these Paleo Breakfast Cookies. Make sure you check out the “notes” and omit the honey in the recipe. It’s full of nutrition and kids love it! Then, there are the mornings where you can swap out a piece of traditional toast for sweet potato toast. Here are 5 ways you can top your sweet potato toast and make it awesome. ﻿ And then, you can have scones! Well, given that you omit the honey and swap it for unsweetened applesauce like in the recipe notes, you’re good to go. These don’t last at my house and I’m sure they won’t last at yours either! In our Family KickStart Program, we use whole30 approved ingredients to recreate some traditional favorite items like muffins and pancakes without added sweeteners for breakfast. The thing is, if you want to succeed eating Whole30 or Family KickStart with kids, flexibility is key. We adults can eat eggs for 30 days straight -or at least we’ll attempt it- but kids… that’s a different story. So you’ve decided that you don’t want to eat eggs every day for 30 days; I don’t blame you! I love to make these Grain-Free Pancake Muffins and enjoy them along with a cup of coffee. Other options are these Grain-Free Morning Glory Muffins or Grain-Free Blueberry Bran Muffins. Both are naturally sweetened with dried fruit although due to their high (natural) sugar content they should be limited. Of course, you can always make a batch of these Spinach & Bacon Mini Quiches and warm them up when needed. Although they are technically eggs, you won’t feel like you’re eating “another” egg once again. They are bite size pieces of deliciousness! 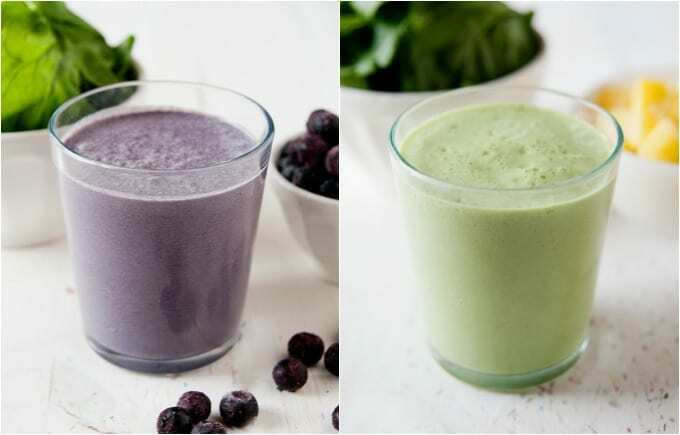 I like to add a smoothie into my day on days where I’ve eaten a lot of protein and didn’t get enough “greens.” One of my favorite recipes is this Blueberry Muffin Green Smoothie because I swear you can’t taste the spinach and it’s not green -something kids do not like at all! When making smoothies to fit your Whole30 and Family KickStart Program parameters, make sure you limit your fruit to 1/2 cup per serving. Too much fruit causes insulin spikes and therefore your body reads it like sugar. You can also try a Low-Carb Strawberry Smoothie Bowl or a Low-Carb Peaches & Cream Smoothie Bowl. They are both satisfying and delicious without too much sugar. If you’ve been a frappuccino fan for a long time and are having a hard time kicking that frozen coffee habit, try my Healthy Frozen Mocha Frappuccino. Whether you serve it in a glass or in a bowl, it’s almost like the real thing -almost- and definitely cheaper! Plus, print out the recipe below to get your coffee “fix” in! 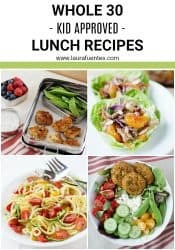 There are the lunch recipes you enjoy at home and there are lunches that need to be made portable. 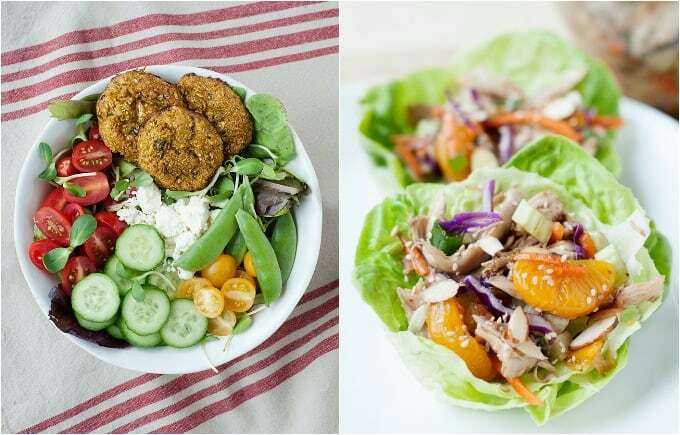 If you want to stick to your Whole30 and KickStart plan, it’s best that you make a couple of delicious staple lunches that can keep in the fridge all week so you can be prepared to eat well. One lunch that I love to make ahead of time is this delicious Asian Chicken Salad. I can serve inside of lettuce cups or over lettuce for a super crunchy and filling lunch. If you have a little more time, these Grain-Free Paleo Falafels have all the Mediterranean flavors we love in every bite without the carbs. They are also an easy way to get more veggies into your day and they freeze great! Having a good lunch container on hand to pack your cold meals (or microwave if you have access) is essential as well. 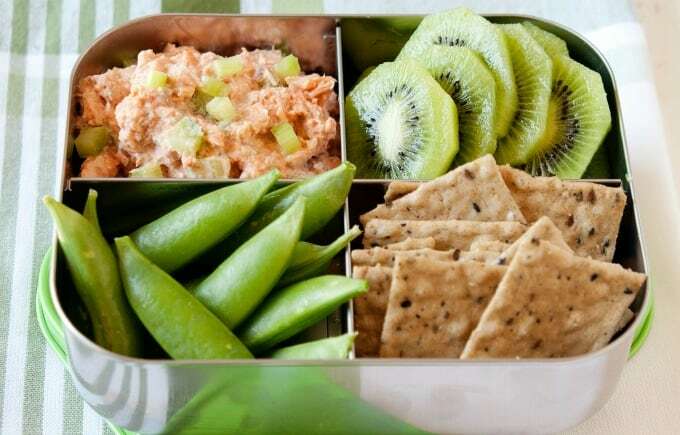 Whether you eat at home or at the office, having a prepped container with delicious food is super helpful. One of my favorite things to make for the week is my Southern Chicken Salad Recipe. It’s super easy to make, it keeps in the fridge for about 5 days and it’s great to wrap in a coconut wrap, top a salad with it, stuff a tomato, serve it with veggies on the side, and more. When you have a good staple like this chicken salad, it’s super easy to make delicious lunches throughout the week. For adding more omega 3s into your day, try my Salmon Salad. While in the blog post you see it pictured inside a pita, it’s super easy to serve on the side with veggies and some seed crackers. Another high-protein lunch idea is egg salad. 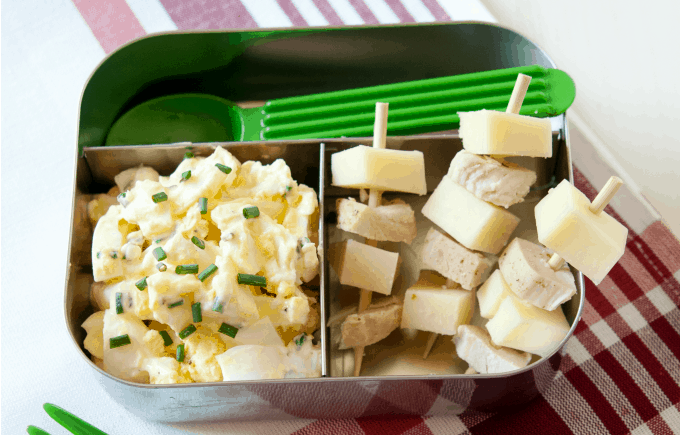 There’s so much you can do with egg salad for lunch! Just like chicken salad and salmon salad, you can stuff it in a wrap, top a bed of salad greens, or serve it on the side like in this lunch. Of course, no egg salad would be complete without making perfect hard-boiled eggs! If your egg yolks come out green or your whites have a rubbery texture, check out the video below to show you how easy it is to make hard boiled eggs that are perfect and easy to peel. If there’s one thing parents want to know is… what can be some healthy whole30 snacks I can have on hand? 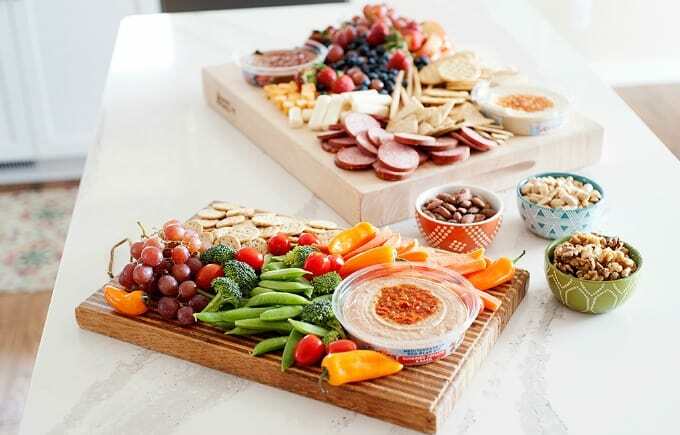 For starters, you can make a delicious charcuterie board in a platter of veggies and cold cuts and keep it in the fridge. 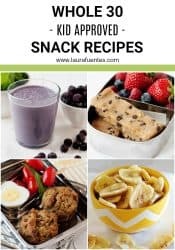 Each day everyone can grab some of the ingredients onto a plate and get snacking. What I love is the variety in the ingredients and everything except the crackers can be enjoyed by the whole family. You can, of course, swap out the whole-grain crackers shown above for plantain chips or seed crackers. When I come home from the grocery, I like to wash and prep all my produce so it’s ready for the week. I know, I know, you’ve heard that before -but it works! If you don’t’ have time for that, save time by buying pre-cut veggies. There are many Whole30 and Family KickStart approved snacks you can buy ready made at your grocery, on Amazon, and one of my favorite places; Thrive Market. Of course, if you want someone else to do all the selecting for you on what’s a Whole30 and Family KickStart approved snack, check out Thrive Market’s entire section of Whole30 approved snack list. Thrive market is Whole Foods meets Costco meets Trader Joe’s meets Amazon. Awesome clean foods delivered right to your door. And you thought we’d never make it to Family KickStart and Whole30 Dinner recipe ideas. What did I tell you, this was the “ultimate guide” post to help you navigate through making healthy choices for your family and sticking to them! If you didn’t know by know, meal planning is key when it comes to making a dietary change, and sticking to it, when you have a family. In this video, I want to share with you how I meal plan when I’m doing Whole30 and Family KickStart. ﻿ Of course, the families that are enrolled in the Family KickStart Program have it all done for them. Meals planned, meal prepped broken down into day-by-day steps, recipes, and shopping lists. But, if you’re doing the meal planning and meal prep, perhaps you want to check out this video showing you some meal prep hacks to save you time. Cauliflower Shrimp Fried Rice: easy to make, loaded with veggies, and versatile because you can swap the shrimp for chicken or beef. Spiralized Zucchini and Tomatoes: this is the perfect 5-minute side-dish you can whip up fast and eat along with a roasted chicken you picked up from the grocery store. 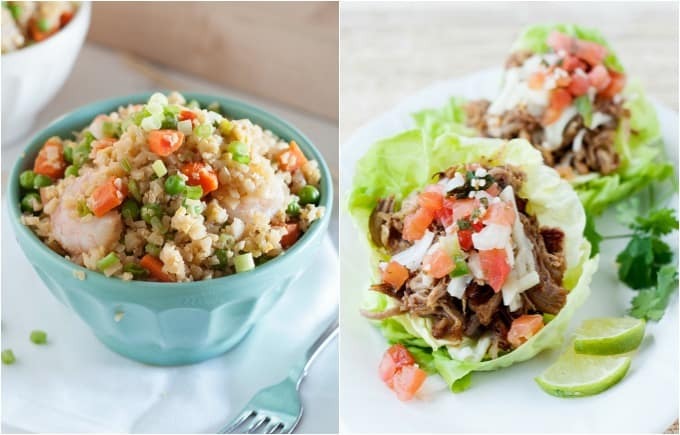 Slow Cooker Pork Carnitas: want a recipe that keeps on loving you throughout the week? This.is.it. You can make lettuce cups with the carnitas, use it to top salads, and even stuff a sweet potato with it! There’s nothing more comforting than a warm bowl of hearty soup at the end of the day. The type of soups that can be a whole meal. You know those. Right? All Meat and Veggie Paleo Chili: With over 10 MILLION visits, this is hands down the BEST chili you’ll ever eat. I promise you that it will become a staple in your household. It’s one of those recipes that gets better a day or two after you make it. Chicken & Veggie Chili: After so much success with the all-meat chili, my community begged for me to create a recipe that was just as good but with chicken instead of ground meat. This recipe delivers! Fire Roasted Tomato Vegetable Soup: Sure, you won’t be eating grilled cheese sandwiches during your Family KickStart or Whole30 journey but a warm bowl of creamy tomato soup with a delicious salad? Yes, please! 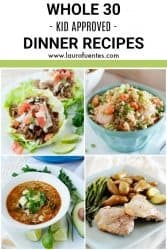 When chicken is a staple in your weekly meal plan but need Family KickStart and Whole30 recipes with chicken that the entire family will love, you need some of these hearty and wholesome recipes you’ll feel good about eating. Garlic Butter Chicken with Spaghetti Squash: Feels slightly indulgent but it isn’t because it’s served over spaghetti squash! This is one meal I love making mid week so I can skip going out to eat at a restaurant and have all the food “feelz” at home. Honey Chicken Drumsticks with Carrot Fries: Oh.my.gosh. Talk about a meal that will make you feel like you’re back at being a kid! Drumsticks are always winners and this is one recipe that doesn’t disappoint. 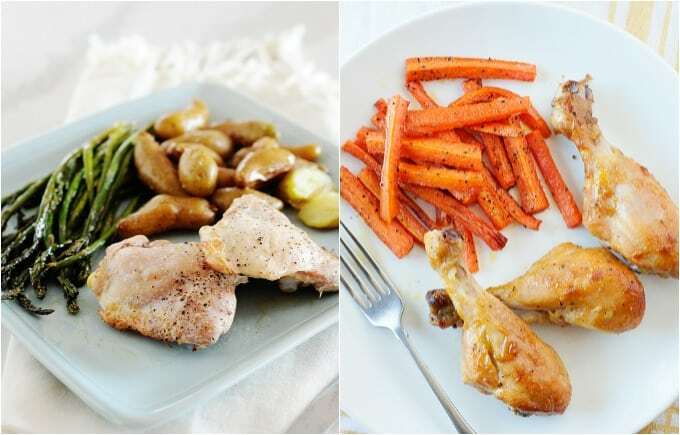 Sheet Pan Dijon Chicken and Potatoes: Sheet-pan everything is my jive because you can throw it all in a pan, roast it, and call it dinner! And while roasting recipes takes a little longer than skillet recipes, there’s no stirring or keeping an eye on the meal so you can really go do something else! Like meal prep for another day. One of the things people miss the most is desserts when they are changing the way they eat. Don’t worry! 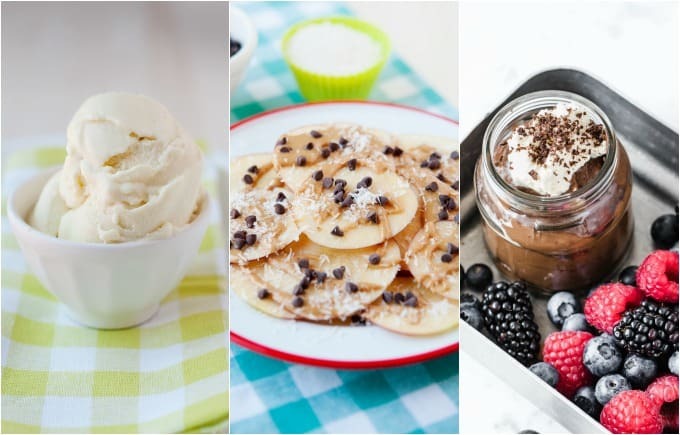 Here are some of my favorite Family KickStart and Whole30 desserts you’re going to love. Apple Donuts: I can’t say more about these than YUM! Omit the chocolate chips but keep the almond butter and shredded coconut and this is one fun treat everyone will love making! Pineapple Whip: Think frozen yogurt meets the pineapple whip sold at Disneyworld. Use frozen pineapple and omit the honey and this is one recipe that will feel like a total treat for dessert! Chocolate Avocado Pudding: Avocado lovers rejoice. You didn’t think I was going to leave you out, right? This is my best-kept secret to using up very ripe (read mushy) avocados. Make sure you use stevia to sweeten. With so many of my readers wanting to do a Whole30 but wondering if their family will be able to adhere, the following are the Whole30 rules we also implement in our Family KickStart Program. This means no cheese, cow’s milk, yogurts, ice cream, cream, sour cream, kefir, and butter. You can have ghee which is clarified butter. In Family KickStart, we’ve created 2 program levels, one of which allows dairy items like butter. This is a total no in Whole30 rules. This means no corn, rice, quinoa, wheat, rye, millet, bulgur, and sprouted grains. In Family KickStart, we’ve created 2 program levels, one of which allows oats and organic corn. Zero. Nada. Happy hour is going to have to wait. I know, we all thought beans and legumes were good for us but for 30 days this is a no-go. This means that you can’t eat beans of any kind, soy products (tofu, soy sauce, miso, or edamame), chickpeas, lentils, peas, and peanuts. Sorry peanut butter! Swap it for almond butter. No honey, maple syrup, agave, artificial sweeteners of any kind (even stevia). In Family KickStart, we’ve created 2 program levels, one of which allows stevia. Both Family KickStart and Whole30 say to avoid processed foods. You will be cooking more than ever for 30 days -which is why having a done-for-you plan is so helpful. Is almond milk considered a processed food? What about lunch meat like turkey and roast beef? Are those processed? Check the labels and to be compliant they need to have no carrageenan, MSG, or sulfites. The quality of food is very important in both programs. If you follow a strict Whole30 program the rules clearly say that you cannot replicate or recreate favorite baked goods or recipes. No recreating “pizza” crust with approved ingredients or “nachos” with fruit. Unfortunately, if you have kids, this is very difficult to do for 30 days. Kids love pancakes, waffles, muffins, and all sorts of baked goods but on the traditional Whole30 program it’s not allowed. This rule is the main reason many parents are making two meals at home, for every meal. One for themselves that is “Whole30” approved and another for the kids. Their meal is fresh, vibrant, and healthy while often times the kids are still eating frozen chicken nuggets and boxed macaroni. Because of this, the Family KickStart Program has recreated many kid-favorite foods with Whole30 approved ingredients parents can feel good about giving to their kids. Having a whole-food flexible program allows them to successfully complete a Whole30 program while feeding their children better. If there’s a “no” eat list, there’s always an “eat” list. And in the “eats” list both Whole30 and Family KickStart agree that you can eat the following. Hurray for veggies! Eat them any way you want. As a mom to 3 picky eaters I know that veggies aren’t my kids’ favorite foods so the Family KickStart Program includes recipes like Bell Pepper Nachos, Taco Boats, zucchini noodles, and more. Fruits are allowed in moderation. It’s important to remember that on Whole30 and on the Family KickStart Program you’re trying to limit your sugar intake for 30 days. What’s fruit allowed in moderation mean? One serving per day, or about 1/2 cup. Your nutrition should come from vegetables not four pieces of fruit per day. Sausage is still okay and so are clean-label deli meats. Learn to read the ingredients and limit preservatives like msg and nitrates. Seafood is an excellent source of protein that adds variety to your meals. Eggs will become a big source of protein -especially at breakfast time. Fortunately, if you have kids, the Family KickStart Program has other breakfast options that kids will love and not grow tired of. Say yes to avocado oil, olive oil, and coconut oil. Ghee, which is clarified butter (butter without the “dairy” part in it) is also allowed. If you want to learn more about why eating healthy fats is good for you, check out this post. You didn’t think I was going to do something for 30+ days and not drink coffee, right? Exactly. Coffee will become your best friend -especially during the first week where your body is adjusting to the switch. However, you can’t add milk products or sugar to drink it down. This is one reason I love Bulletproof Coffee. It keeps me full, tastes amazing, and has none of the above. If you have to have cream in your coffee, try Nut Pods. They are non-dairy and make coffee taste delish. The most important thing to remember when doing Whole30 or Family KickStart is to check the labels. Many of the foods you were eating before had hidden added sugars, preservatives, and stabilizers. When in doubt, choose whole foods, especially vegetables, but also fruits, nuts, meats, and seafood. A few years ago, I did a Whole30 program (twice!) and loved it. Within a week, my cravings for carbs were gone and I began to think as food as a way of nourishing my body. My kids, however, did not want to eat eggs for breakfast three days in a row. Or leftover roasted vegetables. Or fish for dinner (again). For this reason, while I’d love to do a raving Whole30 review, I can’t. It works for me but not for my kids. And if it doesn’t work for my kids and I turn into a kitchen slave… that’s no bueno. And for breakfast? The Family KickStart Program has clean pancakes, muffins, and more with Whole30 approved ingredients. Yes, it breaks their rule #7 of No “Junk” Foods, but with kids, you have to bend the rules. In the Family KickStart Program, you’ll love that many of the recipes are kid-approved Whole30 compliant. You’ll be able to stop being the short order cook and make things like Egg Rolls in a Bowl, All Meat and Veggie Chili, Lasagna Stuffed Squash, Chicken Drumsticks, Bell Pepper Nachos, Loaded Sweet Potato Bars, Salad Bars, and more. Many of the meals are interactive and easy to prep-ahead. Every week comes with a meal map of planned out meals, a completed shopping list, and a step-by-step meal prep guide to help you pull off fresh meals all week long. If you want to learn more about the Family KickStart Program, click here. 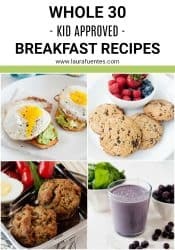 What is my “staple” or go-to recipe when it comes to doing Whole30 or Family KickStart that my entire family loves? Chicken salad. 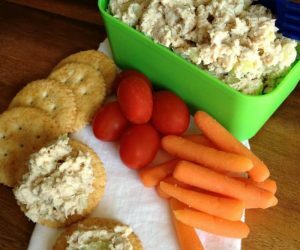 When it comes to packing lunches in a hurry (most days) or grabbing a little high protein snack, the recipe below for Southern Chicken Salad is a winner with everyone in the family. Put cooked chicken in a food processor and pulse a few times to rough chop. Continue pulsing for about 30 seconds until the chicken is finely chopped. *If you turn “on” the food processor, your chicken will become a “paste” instead of very finely chopped. Don’t do this. In a bowl, combine lemon juice, mayonnaise, salt, pepper and Big&Zesty (optional) and blend well. Serve with crackers or on top of a bed of lettuce.